Maggie Waligora, Laura Kennedy, and Allie Penn, presented at the National Digital Stewardship Alliance (NDSA) conference in Pittsburgh on Thursday (October 26, 2017). Their presentation, entitled, "Say It Loud, Say It Proud: Advocacy and Engagement". The students shared Detroit-based digital preservation projects as part of their presentation. The full presentation description states: "The preservation of digitized and born-digital objects is imperative to sustaining the historical narrative of any city. In this presentation, the Wayne State University NDSA student group will explore issues pertaining to digital preservation in the Detroit community through the creation of a digital preservation plan for three cultural institutions." All three students are active in the Wayne State University student chapter of the National Digital Stewardship Alliance, the first student chapter of NDSA. 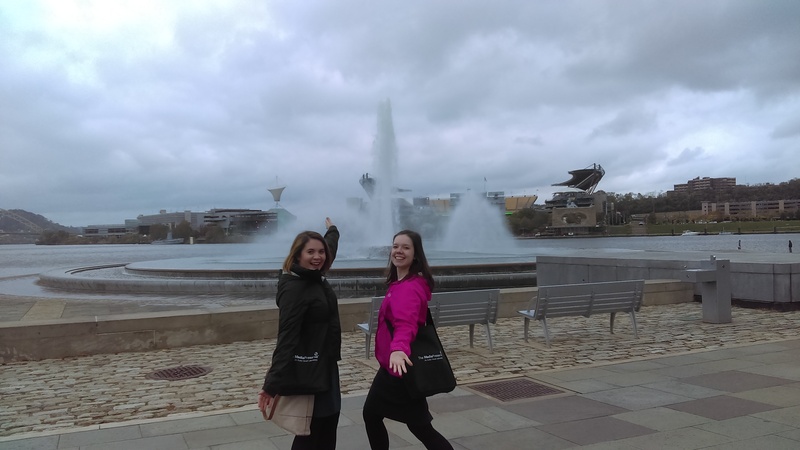 Photo: Maggie Waligora and Allie Penn in Pittsburgh. Thanks to Allie Penn for the photo.